We’ve designed an add-on sailing rig to add to the versatility of our popular RowCruiser vessel and other rowboats or canoes. This trimaran setup has been carefully designed so the sliding seat rowing system is not impeded by the amas (outriggers) or the sailing rig. 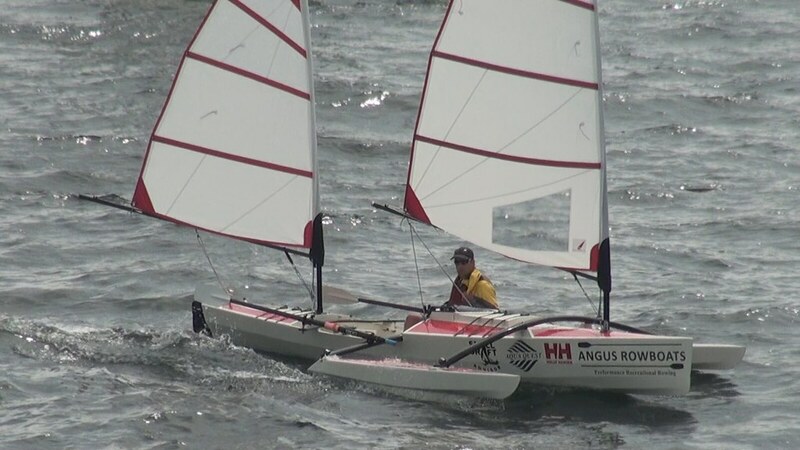 This allows for easy transitions between rowing and sailing, or both modes of propulsion can be used simultaneously in lighter winds. The amas are shaped so that the buoyancy kicks in quickly, providing significant lift with moderate submersion. In addition, the bottoms are shaped to plane easily at low speeds, further reducing friction. In a good breeze the RowCruiser will sail up to 12 knots for fun stable sailing. The simple elegant ketch rig makes for balanced sailing, and easy deployment. The hollow wood curved laminate akas (cross supports) are a unique design that provide high strength with minimum weight. Each ama weighs exactly 10 lbs., and the akas are just under 10 lbs each. Click the image below to see the Sailing Conversion System Photo Gallery. Our plans and manual include full-sized templates for the amas, daggerboard, rudder and many other components. Detailed instructions are provided for constructing the amas, akas, sail mounts, daggerboard case, rudder, daggerboard and rigging assembly. Additionally, a list of online retailers and part numbers are provided for all the components required – sails, masts, blocks, lines, etc. Total cost of materials, including the sails, is about $1400. While this sailing rig has been designed for use with the RowCruiser, it can also be adapted for other long slender boats such as canoes. The curvature of the akas would need to be modified for the particular boat it was going into, and the mast mounts would need to be adapted. Watch a video of the boat below. To purchase the Sailing Conversion Plans please click on the red link below. Includes full sized plans and manual. DXF files available for an extra $10.